To Plastic Containers From Glass. Gerber Baby Food is switching to plastic containers from glass. So collect all you can from this and other baby food companies! Company says parents prefer the plastic. We crafters will have to be more creative and come up with a uses for plastic containers. I was interviewed by the Associated Press and CBS New Radio about the changes. (But quoted in a very limited format.) I explained how many schools, sunday schools, camps and scouts used the glass for very professional looking crafts. The free and easy to collect bottles greatly stretched limited budgets. They are also great to store as they clean so easily both the metal lid and the glass jar. But we all understand the companies reasoning. Less breakage on the store and home shelf. We will just have to be a little more creative and move to larger bottles with lids: Sauce, pickle jars, etc! Preschools, Camps, Sunday Schools, Scouts and others all try to use recycled materials where ever possible. One such recyclable I highly recommend is baby food jars. The jars of most brands I have come across are made of thick glass and can withstand microwave ovens. This makes them sturdy for little hands to use and heat resistant enough to be used in some crafts that need to be baked in the oven. It is amazing how easy and quick they can accumulate. I announce to my campers that I need some and in a few weeks I usually have 100 or more brought in to my class. Announcements in Church, Temple and school bulletins will often bring results in a few weeks. Make sure to say you want the lids. The labels can be easily ripped off without soaking. Polymer Clay on Paper Mache Havdallah Box. Plus I just added more to my Clay on Glass Pages. Give each child a foam plate with their name labeled in permanent marker. It helps label projects in progress. Cover with paper towel for sand, glitter, crystal wax projects. It catches extras that can be recycled. Give each child a piece of wax paper to work their clay on to keep their clay clean. Label with initials or names every project as you take them away from the children. Don't expect to remember who made something and most children will forget what their project looks like. Use permanent marker on the bottle of glass jars and lids before you give them to a child. When using sand or wax crystals work one color at a time for the whole class. If possible help them lift their jars after each color to recycle the spills. If not at the end dump all into a multicolor collection bowl. The multicolor can be used in another project or as a layer in the project. SNOW GLOBES- Snow globes can be made with sparkles, metallic confetti and other non melting objects. Children love picking out different objects to put in their globe. The different shape metallic confetti is the most popular. Fill the jar to the top with water and cover tightly. Many craft books show globes be made in soda bottles and other objects but they use corn syrup instead of water. I have not tried it yet but it looks like fun. called Mother's Day Snow Globes. Clay Covered Bottles and Lids. Cane method of decorations. TOOTH FAIRY JARS- Cover the top and side of the lid of a baby food jar with Sculpey clay. Make sure to trim the edges to allow the lid to sit back on the jar. Use one color of clay, multicolor ( marbleized) or use cane slices. ( See my Clay Page for directions for Sculpey) Use a white clay to make a large tooth. Press gently to make it stick to the clay on the lid. Label the inside of the lid with the child's name or initials using a permanent marker. Bake the lid. When the clay cools, glaze the cover. (see above) Using a permanent marker decorate the jar with the child's name. For example: Micah's Teeth. Sand Art with Clay Covered Lid. Stamped design. Wax Crystal Candle with solid wax poured on top to seal. SAND ART/CRYSTAL WAX CANDLES- Give each child a plate. Cover with a paper towel to allow recycling of materials. Work one color at a time with the entire class. Make each layer at least 1/2 inch. If using sand layer up to the top so when cover is placed on their is less room to allow the colors to mix. 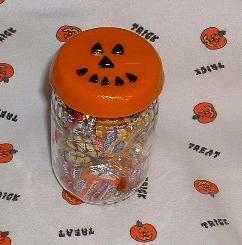 ( Depending on what shape the jar is there still may be an air space after the lid is placed on. Caution against unnecessary tipping.) Tap lightly to allow settling before covering with lid for sand art. At any point use a tooth pick or a bamboo stick and push stripes around the outside of the sand/wax to add designs. The lid for sand art can be left plain or decorate. For wax crystals buy wick with wire core and place in metal wick holder. Place in center of jar and start adding crystals in layers like sand art. fill to at least 1/2 to 1" from the top. Take from the children carefully bring them to the kitchen or hot plate where over a double boiler block wax is melted with a color and scent. Fill to top with melted wax. Watch after some cooling to fill in any depressions. Check directions from company on other methods of sealing jar. Lory was a parent volunteer in her 1st graders class at Holy Rosary Academy in Nashville, TN. She used Sulpey Clay to cover baby food jars lids. She had some pvc pipe and copper pipping left over from her husband's projects that she used as rolling pins. She asked McDonalds for some plastic knives, as they are smoooth. She used two colors orange (sweet potato) and black. Some kids just made round balls and squished them to make the face. She took them home to bake and sprayed them with acryllic spray, after they cooled, for shine. She filled them with candy. She and the project were a hit. Thanks Lory for letting me show your work and your picture. Do you have a craft and picture you want to share? Email me.